Tughlaqabad Fort. 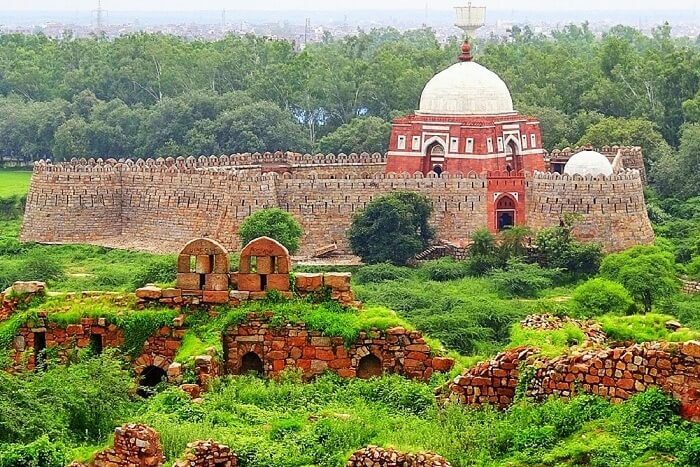 The founder of the Tughlaq dynasty, Ghiyas-ud-din-Tughlaq fortified and built the fort called as Tughlaqabad fort. It is in ruins state now. It was built in the year 1321 AD. However the Tughlaq’s lived for a very short stint in the fort. It was later abandoned in the year 1321 AD. In the year 1320 the Khiliji dynasty was illegally usurped in a coup by Khusrao Shah. 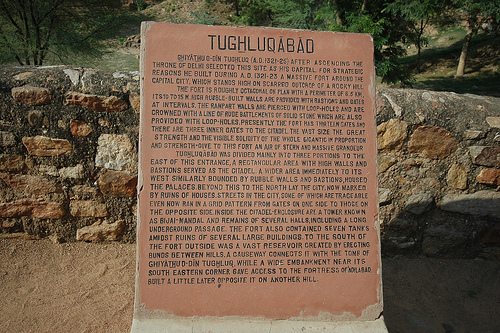 At that time Ghiayas-ud-din Tughlaq became the ruler of Delhi and founded Tughlaq dynasty. At that time Tughlaq faced a huge challenge from Mongols. To keep them under control, Ghiyas-ud-din-Tughlaq built this huge gigantic fort called as Tughlakabad fort. Tughlakabad is built strongly with red sand stone rather than giving any architectural importance. 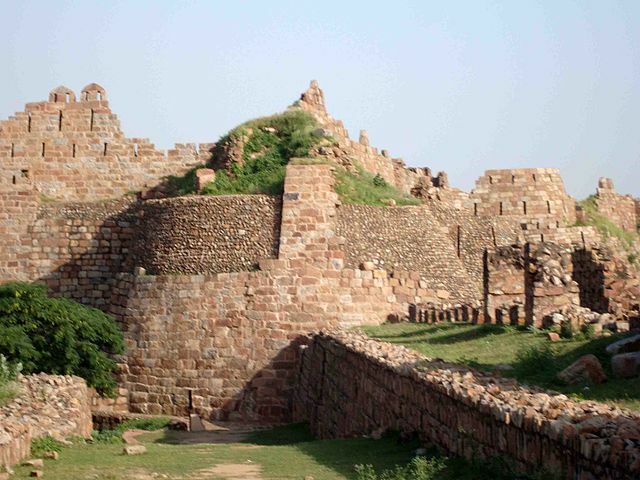 The fort served as a defence from enemy attack and as a capital of Tughlaq dynasty. The fort surrounds the irregular ground. The fort has huge structure with walls as high as 10-15m high. Supporting the walls are the parapets and the bastions. It is believed that the fort city had nearly 52 gates and only 13 are remaining as on today. The fort city was further divided into area with houses all around a grid in the north and citadel and palaces to the south. Today the city portion is in ruins however the citadel is intact. To the south of the main entrance is the tomb of ghiyas-ud-din. The mausoleum is connected with a causeway. The causeway which is 6ft in length is supported by 27 arches. The original tomb is built with single square dome with sloping walls. Inside the large imposing fort is the elegant dome with an octagonal drum which is covered with white slabs of marble and slate. There are three graves inside the central one is of the Ghiyas-ud-din and the remaining two are that of his wife and son. There are number of monuments within the fort. Even though most of the fort is in ruins and not in good condition, still the fort holds its own beauty and a visit to this place is must. Nearest metro station: Okhla metro station.